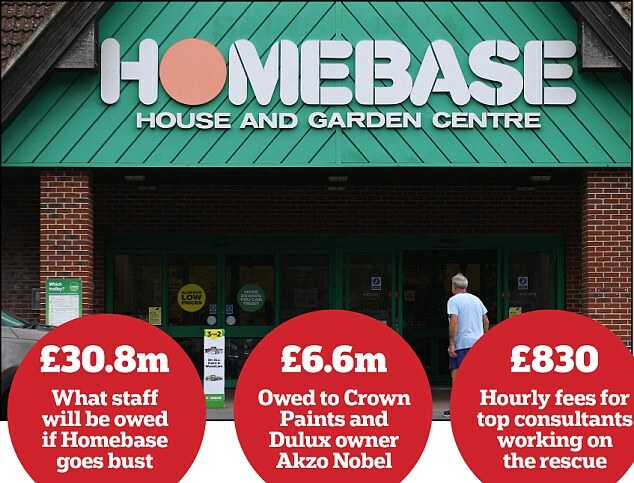 Homebase owes more than £1bn to employees, landlords, suppliers and other creditors – but only has £151m spare to pay them if it goes bust. High Court documents seen by the Mail lay bare the dire state of its finances ahead of a vote tomorrow on a critical deal to rescue the DIY chain. Homebase is seeking approval from creditors to close 42 stores and secure rent reductions of between 25 per cent and 90 per cent on 70 others through a company voluntary arrangement (CVA). If it fails to win backing for a restructuring plan, it could plunge into administration, owing creditors £1.2 billion and leaving 11,000 staff out of a job. It is understood that creditors face getting less than 10p for every £1 they are owed if Homebase collapses. Even if a deal is reached, some still face heavy losses, including landlords. But staff at Alvarez & Marsal, the outside consultancy handling the crisis, are raking it in. High Court filings show that top directors and partners at the firm will get as much as £830 per hour for working on the deal. Alvarez & Marsal is set to pocket a minimum of £750,000 from Homebase if the restructuring is approved. This figure is likely to rise further after expenses are added to the fees. If Homebase goes bust its 11,000 staff could be left out of pocket by £30.8m. The taxman could also lose out on £19.4m. Trade creditors, who include suppliers and tradesmen, are owed £439.2m. They include Crown Paints, owed almost £2m, and Dulux paint owner Akzo Nobel, owed £4.6m. Local councils, which set business rates, could be owed £43.7m while shop landlords stand to lose £439.1m. British retailers are bracing for a £320m hit as higher temperatures melt sales. The British Retail Consortium said warmer weather in September could cost non-food retailers £80 million per week. Based on a Met Office analysis data, it argues that there is a clear relationship between temperature and retail sales. Homebase was plunged into financial ruin after Aussie DIY owners Wesfarmers bought the home improvement chain for £340m in 2016. The disastrous takeover saw Wesfarmers rebrand Homebase to its Australian brand Bunnings and alienate loyal customers by ditching popular products and concessions. Homebase has since been forced to close its distribution centre and restructure its head office, leading to the loss of 300 jobs. It was bought for £1 this year by HMV owner Hilco Capital, which has promised to plough £25m into Homebase if the CVA is agreed. Documents seen by the Mail show bosses want to bring back concessions such as Habitat and bring in new ones such as Carpetright and Pets Corner. But support for the rescue deal is in doubt, with landlords preparing to mount a legal challenge. Richard Fleming, European head of restructuring at Alvarez & Marsal and lead adviser on the CVA process, said: ‘The CVA is a vital lifeline for Homebase, and provides the management team with an opportunity to turn the business around and secure its long-term future for the benefit of all stakeholders, including landlords, employees, customers and suppliers.’ Homebase declined to comment.